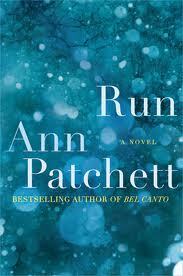 I remember when I first read Bel Canto by Ann Patchett. I was stunned. I was beyond stunned. I found myself crying in parts and pieces of the book, which doesn’t happen too often to me. While Bel Canto was about strangers getting to know each other under the most unlikely circumstance, Run is about family, roots, and love at a larger level and perspective. “Run” happened to me while reading The Novel Cure and of course I had embarked on the Novel Cure challenge anyway, so it had to be read in that order. “Run” is not an easy book to write about – not because the plot is challenging or the story is difficult to follow. The reason it is challenging is the voice Patchett gives her characters & the conflicting and most unlikely situations she throws them in. Bernard Doyle – the former mayor of Boston, only wants to see one of his sons grow up and enter politics. His oldest son Sullivan is out to follow his heart. Tip and Teddy Doyle are inclined to do what each wants to – work with fishes – aquaculture and the second one wants to become a minister. An incident involving a mother and her daughter on a cold winter night is what shapes the entire course of the book. What Bernard then wants to do is keep his children safe. That becomes the sole objective. Nothing really matters. The tone of the book is fast-paced and yet you tend to stop through paragraphs and pages and mull over what you have read. Patchett has this uncanny writing style – she writes so nonchalantly (or so it seems) and suddenly the reader is left astounded with sentences, that are packed with emotion and hit the reader in the face. Run is a book that you will go back to and reread at some point, because it demands to be reread. It is that good. This entry was posted in Ann Patchett, Books, Harper, harper perennial, Literary Fiction, Review, The Novel Cure Reading Challenge and tagged adoption, Ann Patchett, Bel Canto, family, loss, Love, Run, The Novel Cure Reading Challenge on November 7, 2013 by thehungryreader.